This festive European river cruise vacation begins in Prague, the beautiful capital of the Czech Republic. See famous sights like Old Town’s Astronomical Clock and the Charles Bridge, but also get the unique chance to stroll through the Christmas markets. It’s a treat to see the rows of brightly decorated wooden huts that sell Christmas tree orna-ments, wooden toys, and Czech handicrafts. Explore to your heart’s content with a warm cup of svarené víno (hot mulled wine). 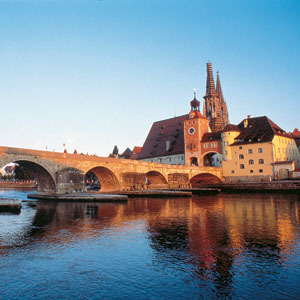 Board your river cruise vessel in Nuremberg, Germany, with its medieval fortifications, gothic churches, and palaces. The Old Town is illuminated with festive lights and decorations and the Christmas market, one of the most famous in the world, has dozens of stalls offering traditional wares, such as Lebku-chen (spiced gingerbread), Glühwein (hot mulled wine), and unique decorations and ornaments. Learn about local Christmas traditions, as you cruise to historical Regensburg, the only German city not bombed during WWII. After a guided tour, savor local sausages at Historiche Wurstküche (Old Sausage Kitchen), one of Germany’s oldest restaurants, and enjoy a tasting of German beers. Experience Passau’s charming Christmas market set against the breathtaking backdrop of St. Stephen’s Cathedral-a masterpiece of baroque architecture. Arrive in Melk, Austria, and tour the magnificent 11th century Benedictine Ab-bey-one of Europe’s largest monasteries. As you cruise through the wintery landscape of the picturesque Wachau Valley, enjoy the view with a tasting of traditional Austrian cookies. This Christmas river cruise ends in Austria’s magical capital of Vienna, home to the sounds of Mozart, Strauss, and the Vienna Boys’ Choir. See the famous sights with a Local Guide, or opt to go on a culinary tour through the Christmas markets to get a taste of all the best flavors Austria offers during this time of year.